Pinterest is here to stay and it would be a missed opportunity to ignore it as a photographer. 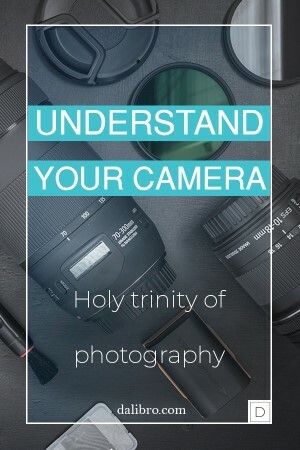 I collected several tips during my intensive research and use of the platform and tailored this post specifically for photography enthusiasts, hobbyists, and professionals. And pretty much for anyone creating something visual and trying to promote it online. Right here! What’s Pinterest and why is it interesting for photographers? Should I use Pinterest for marketing my work? What to pin on Pinterest as a photographer? In case you somehow never heard of Pinterest, you may ask ‘what is it?’. I am about to tell you. Pinterest is a social network that’s around since 2009. What’s in it for the users is that they can upload, save, sort, and manage images (so-called pins) through collections (so-called boards). Those pins often lead to content outside Pinterest. This fact will become important later in this article. Although I’ve just referred to it as to a “social network”, the real purpose is much more exciting than that. In fact, the social aspect is rather limited. Pinterest is essentially a visual search engine with extra features. It allows you to look for ideas, inspiration, tips, knowledge etc. using a classic search bar but showing you the results in a visual way. And honestly, that’s just genius – in my eyes, Pinterest is the only direct competitor of Google Search. Yes, I’ve just said that. I am convinced, that using Pinterest for marketing your work (whatever it is – photography, blogging, design, crafts, cooking, fashion etc.) is one of the best ways of bringing it out there. The more physical and visual whatever you do is, the easier it gets. Yes, there is a lot of weddings, babies, fashion- and food-related topics (there you go – pretty visual). But I can really see the shift – there’s definitely more varying content nowadays. Loads of it is travel, education, DIY, decoration, and maybe surprisingly – business. And finally – photography is gaining great exposure, too (good use of the “E” word, right?). What’s really big is “inspirational” quotes. I have a bit of a love-hate relationship with these if I’m being honest. They just feel too cheesy to me. But they’re extremely popular nevertheless. One last thing regarding to “what” is on Pinterest – it is the users creating the platform. Which is another strong unique selling point. Wherever in the internet jungle you are, you can save an image on your Pinterest board. There are many plugins for your browser that will enable you to do so very easily. Regarding who’s on the platform – yes, it does feel that the majority of Pinterest users is women. I also start seeing more and more blogging couples which is a nice change. Whenever I want to start following some new interesting people, I really struggle with finding some fellow testosterone. And when I do find it, it often belongs to an inactive or quite suspicious account containing only click baits, ‘grow-your-Instagram’ kind of thing or really short skirts and plunging necks. Just saying. So be careful with who you’re gonna follow. On the plus side – being a man on Pinterest might somewhat be an advantage BECAUSE we’re so few. Hell yes! As of September 2018, Pinterest has reached 250 million monthly active users. 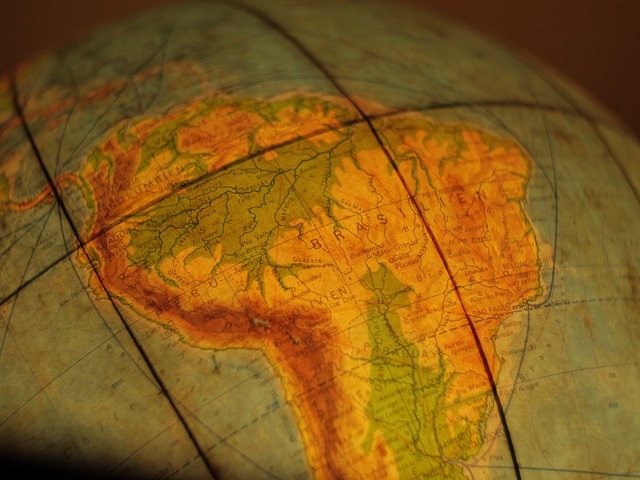 That’s about 40 million people more than they live in Brazil. Every single month. Surprisingly though, the reaction I often get when I talk about Pinterest is rather skeptical. Like “What, people still use Pinterest?”. Or “Wait, isn’t it all about weddings and food?”. And my favorite cliché – “Pinterest is just for women, right?”. Let me tell you – Pinterest is silently growing strong. And in a much healthier way than for example Instagram. Yes, Instagram is probably bigger. I deliberately use the word ‘probably’ because, with all respect to IG, I would bet my Gryffindor socks that lots of those 1 billion users a month they claim ain’t real people. The idea of putting Pinterest and Instagram on the same level seems like overkill at first. But think about it from a perspective of someone creating things. When you create something, you usually want people to see it. As a photographer, you want to post your image somewhere visual. And there you go, 3 biggest options – IG, FB, and Pinterest. Guess which one of the 3 is the most neglected one. In my case, though, it generates around 90% of the traffic. My blog is still really small so the amount (and quality) of the traffic from Pinterest keeps staggering me. Not only in the absolute numbers but also in terms of recurring traffic for my older articles. The shelf life of a good pin is not measured in seconds like on some other platforms but in weeks, months, maybe even years. Good niche choice, content quality and appealing pin visual will in long run beat timing tricks, bots and finding ways around algorithms. Now, this is not a post that should include all about how Pinterest works* but rather focus on photographers and how they can use it. So I won’t talk much about how often you should pin, about the ratio between your own content or how you should organize your boards. *For that, I can highly recommend Jeff Sieh’s Manly Pinterest Tips Podcast which is simply excellent. I also like checking SlayingSocial every now and then. Or just go to Pinterest and look for “how Pinterest works”! So what should you post on Pinterest and what might you re-consider? OK, let’s have a look. My favorite. Providing some good piece of advice or information works simply the best. Anything that has a “how to” in the description can become a great pin helping other people do something! In fact, I urge you to have your own blog as a photographer. It will allow you to turn pretty much anything you create and experience through photography into a blog post. Btw. if you don’t have one yet, you can save 50$ on hosting here. Do a research about what’s in demand in terms of photography, write a great article about it and pin it on Pinterest with a good description and a couple of hashtags. Use your photography to design your pin, work on the pin branding, so that people will start recognizing your work at some point. Include your blog name on the pin image itself. Even if someone downloads the image or the link gets somehow broken, the name of your blog will not be forgotten! Experiment with layover texts and various designs. Speaking from my own experience – you should always use a layover text in some form for pinning blog posts. It gives the potential reader a quick heads-up regarding what you write about! If you only pin a picture, nobody will know there is an entire awesome article behind it. Always write a good description when creating a pin! 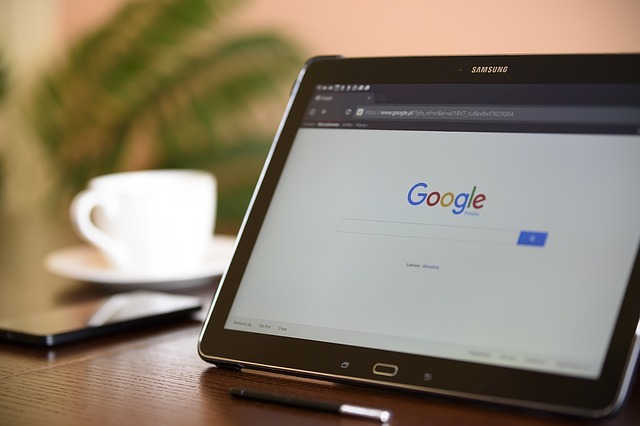 Although Pinterest is really good at identifying what’s depicted on your pin, you should never underestimate the good old-fashioned SEO-freindly text. Personally, when I see no description, it makes me question the pin – a sign of laziness? (“is it even worth clicking the link and reading the full article?”) or is it some stolen content? (“who knows where the link leads, I better not click on it…”). So just do things properly. And finally, don’t forget to repin every now and then! If you repin your content within a reasonable timeframe, it’s nothing bad and not considered spamming. I personally like to loop one pin about 1x a month. TIP: ‘How to loop a pin?’, you may ask. Maybe you’d like to check Tailwind. It is an app that helps you schedule your pins (it really is all about scheduling, not about creating fake engagement!). It also offers some great features like SmartLoop or Tribes. And because they are an official Pinterest partner, you don’t break any Pinterest rules by using the app. I find the service incredibly helpful. Sounds kind of obvious, isn’t it? Displaying your work is what you wanted. But it’s not all as straightforward. Don’t just bash your images onto the platform before you consider the following. A lot will depend on what type of photographer you are. So for example, a wedding photographer will want to present different kind of images than a landscape photographer. Also, do you want to reach potential clients and lead them to your website, where they can book your service? Are you trying to sell prints? Or rather just present your portfolio to anyone who’d enjoy looking at it? Think about what your potential audience/clients will look for. What are they interested in? What can draw their eyes to your pin in the jungle of other images? Finally, one little warning – even Pinterest isn’t a saint, so be aware that your pin visuals will be downloaded at some point and used somewhere else by someone you’ve never met. I’m naive enough to believe that it’s mostly innocent but sometimes it’s blatant stealing. The best way to fight content stealing is including some kind of watermark – your name, logo, website embed in your pin. Even if someone else uses the pin image, it will still bear your brand. This way, it will actually still work for you! TIP: If you have a blog, link your artwork to it. If you’re selling prints or other products, link your pin directly to your shop. 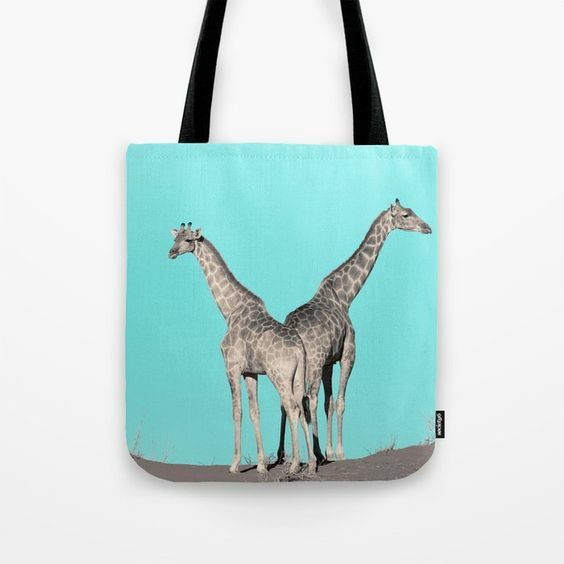 Use an image of your photograph in use where possible (see the giraffe bag below), rather than uploading only an image. Also, never upload your images in full resolution to Pinterest (or any other social network when it comes to it). Society6 offers the Pinterest share button that will lead from Pinterest directly to the product. Yeah, by now, you may think I’m some kind of anti-instagrammer. And look at me now, suggesting using Pinterest to support your Instagram account. For me, it’s not really an option but I’m sure there is a lot of you out there focusing strongly on your Instagram growth. Because Pinterest enables you to save any picture as a pin and add a link to it, there is nothing simpler than doing exactly that using your IG image, IG description and link to your account. Believe it or not, you can’t succeed on Pinterest without sharing other people’s work. In fact, it is absolutely crucial to do so. 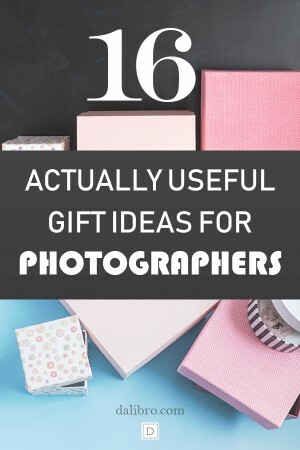 #1: A Pinterest user thinks differently than a Pinterest creator – very important to realize; suppose you’re someone interested in food photography who wants to improve your skills. You don’t care about the author. In fact, you might want to see how different food photographers handle certain food photography problems. If only there was an entire board dedicated to food photography filled with tips from the best photographers all over the world… Now that’s how a Pinterest user thinks. Keep it in mind. It is also absolutely critical to share high quality pins and create fantastic boards! Please, please, please – don’t just pin anything to reach high pinning activity. Whether photography or blog posts, ALWAYS check pins before pinning them. Especially to what website they lead to (yes, there are also spammers on Pinterest). I’m 100% convinced that if you do that, people will realize that you only share awesome articles, images or tips and no rubbish. Other pinners will notice too and start pinning your stuff every time they see something new from you. Quality it is that will defeat the bots. OK, all the above ideas are essentially about marketing yourself and having some kind of strategy for Pinterest. But you should also stay a user. I’ve also seen photographers collecting people’s posing for their portrait images. And if you’re a wedding photographer, you might want to collect some creative lighting ideas or unique perspectives for your next shoot. The sky is the limit, what I love about Pinterest is that you can use it across the Internet. Can’t find any composition of your favorite landscape photographer on Pinterest? Well, then just google it and pin it on your board. Easy peasy! Another question that’s asked often. The answer is not 100% clear even to professional pinners but I tend to a ‘yes’. I think it is a good practice to use a couple of hashtags (personally, I stopped using more than 5) when writing a Pin description. Be careful though and don’t go too crazy, avoid hashtag stuffing. Remember that although the very generic hashtags work across multiple social networks, most of them are different on each platform. The great function of hashtags is, that they help the audience to find new content. That’s because pins with a hashtag are sorted chronologically when you search for that hashtag. I like this feature since it gives you the chance to show your work to people even without having tons of repins / comments etc. In other words, you don’t have to be a Pinterest mega star to show your work to big audience. 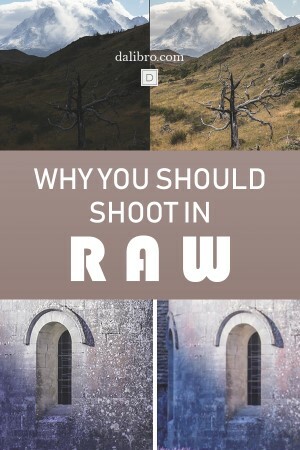 Example: I wrote a supernerdy article about the RAW format in photography. Since the RAW format is something that’s not known by the “non-photographer” audience, I considered it a photography hack of some sort. Now, this pin is nowhere near the top Pinterest search result for “Photography hacks”. However, because I used the hashtag #photographyhacks, it stayed on the top result page for this hashtag for something like a week. Until other users using #photographyhacks pushed my pin out. 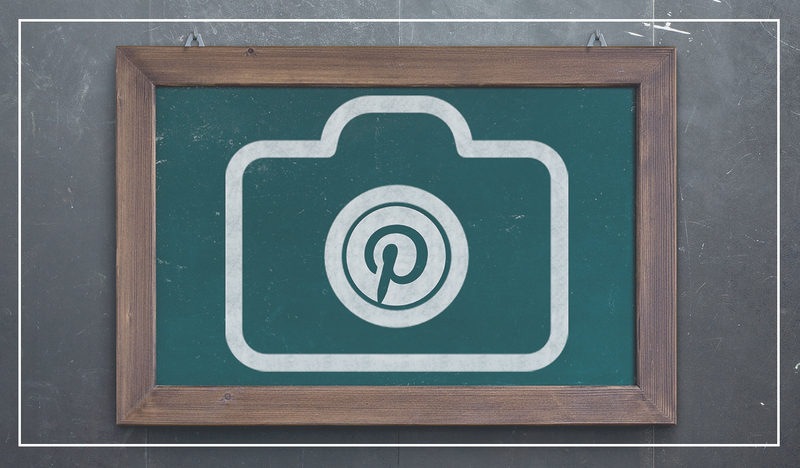 On Pinterest, hashtags tend to be fairly specific, like #caramelrecipes or #diyphotobooth. Unless you’re sure you have a great hashtag idea that could blow up, don’t spend too much energy on adding hashtags which don’t exist (you’ll get a contextual help when typing the # symbol to see that). TIP: All this hashtag business is nice to have but you’ll always be better off investing your time and effort into great SEO-optimized pin descriptions. Your microblogging approach will help you more than all hashtags combined. There is nothing like creating something new and of course, I encourage you to do that. However, we are not machines and generating a new piece of artwork every other day is simply not possible and may even have a catastrophic impact on quality of your work. Pinterest is great for refreshing your work and presenting it again to the Internets. 🙂 You can analyze your older pins and simply repin the most successful ones. Or you can experiment with the pin visual! That’s something you should generally do. Try to be consistent and stick to your branding but also try new things every now and then. 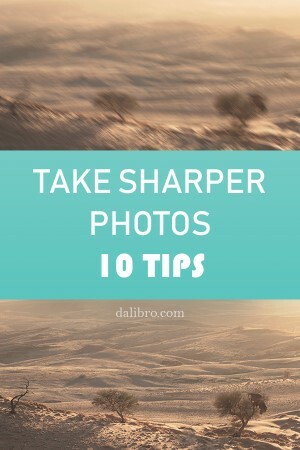 Below, you can see how I recycled one of my most popular articles about taking sharper photos on your next trip. I tried out several versions of the pin visual and one of my most successful remakes was an infographic summarizing the article. So if you don’t want to read through the entire article, at least you can have a look at this “cheat sheet”. It was a bit of extra work but nothing compared to writing a completely new blog post. And it may still help someone a lot. I rather spend time on adding value to something I’ve already done. I’ll happily invest energy into re-marketing a piece of my work I believe is really good, rather than starting something completely new just for the hell of it. Super most awesome article on Pinterest eva! Love your tips and graphics to support them.